SIZES 3" - 24". Larger sizes available upon request. Each FJ-Restraint ball end provides a bending angle of up to ±15° to ±20° (depending on size). This corresponds to a total bending angle of ±30° to-±40°. By varying the length of the sleeve, the FJ-Restraint will also accommodate lateral offset of 4 to 20 inches. When special conditions demand, a FJ-Restraint of 3 to 12 inches in size can accommodate an additional bending angle. Please contact Romac Industries, Inc. for assistance when your application requires special consideration. Since all of the FJ-Restraint's expansion occurs inside the ball joint, there is no need for expansion type sleeves. 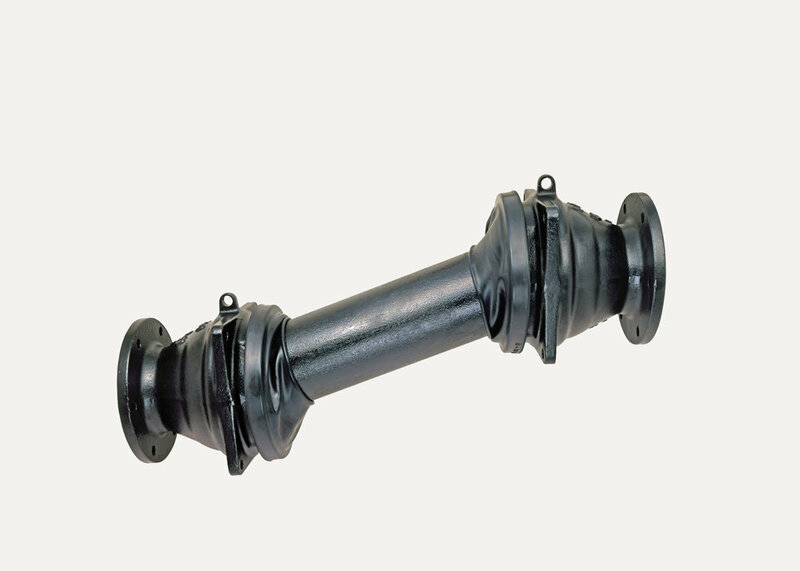 The centrifically cast ductile iron sleeve is one piece, which minimizes any turbidity. The design of the FJ-Restraint allows rotation or torsion of the pipeline components. This freedom of movement prevents damage to flanges, valves and other structures associated with the pipeline. Romac FJ-Restraint's arrive from the factory with tie-rods in place to prevent deflection and changes to the end-to-end dimension during transportation and installation. Tie-rods are then removed once installation is complete. The FJ-Restraint requires no threaded fasteners for assembly. 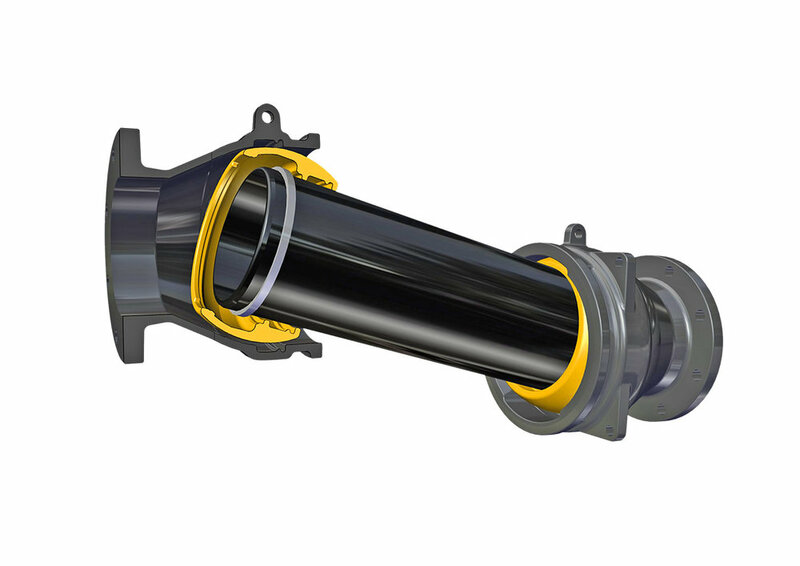 The advanced design eliminates the need for flanged assembly connections in the casing(s). The resulting one-piece casing construction is an essential element that achieves restraint capabilities of 8.4d* tons of force for all sizes. By eliminating unnecessary components, the compact design allows a lightweight assembly for ease of installation. *Where "D" is in inches. CASTINGS The casing, ball and Sleeve are cast of ductile (nodular) iron, meeting or exceeding ASTM A 536, Grade 65-45-12. FLANGE Compatible with ANSI Class 125 and 150 bolt circles. MJ ENDS Mechanical Joint ends meet the dimensional requirements of either ANSI/AWWA C111/A21.11 or ANSI/ AWWA C153/A21.53 depending on size. Standard MJ gasket is used with this fitting. 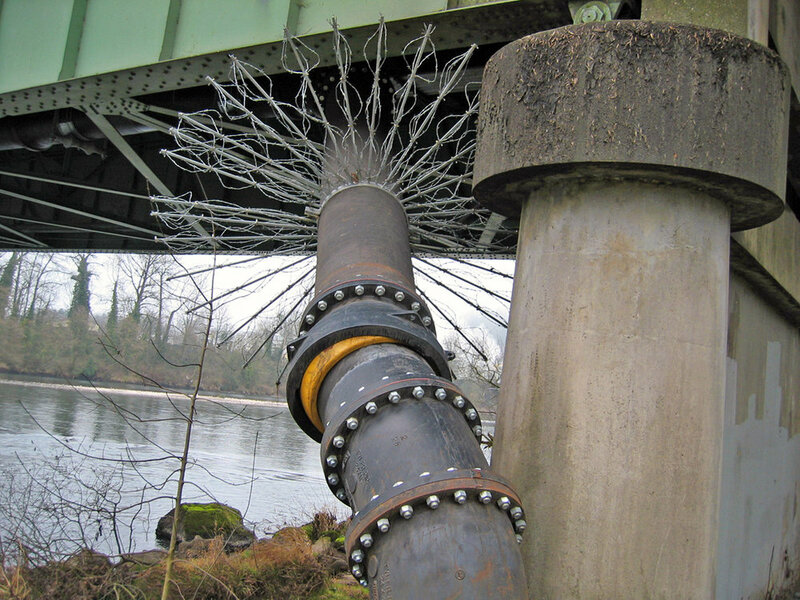 Transition gaskets may be used for iron pipe size pipe. MJ RESTRAINT To securely fix MJ ends of the FJ-Restraint, Romac Grip Rings (for DI, C900 OR IPS PVC) or Roma Grip (for DI or 3”-12” IPS steel) can be supplied. LOCK RING Series 400 stainless steel. Limits expansion and contraction of FJ-Restraint up to maximum working pressure. RING GASKETS Ring gaskets are made of dual Ethylene Propylene Diene Methylene (EPDM) compounded for water and sewer service. CASING COVERS 3 - 12 inch covers are made of Ethylene Propylene Diene Methylene, (EPDM). 14 - 24 inch covers are Protective Polyethylene debris cover. COATINGS The entire fitting is lined and coated with fusion bonded epoxy, applied in accordance with AWWA C213. PROTECTIVE SLEEVE Polyethylene sleeve, 8 mils thick per AWWA C105 to cover entire FJ-Restraint assembly after installation. 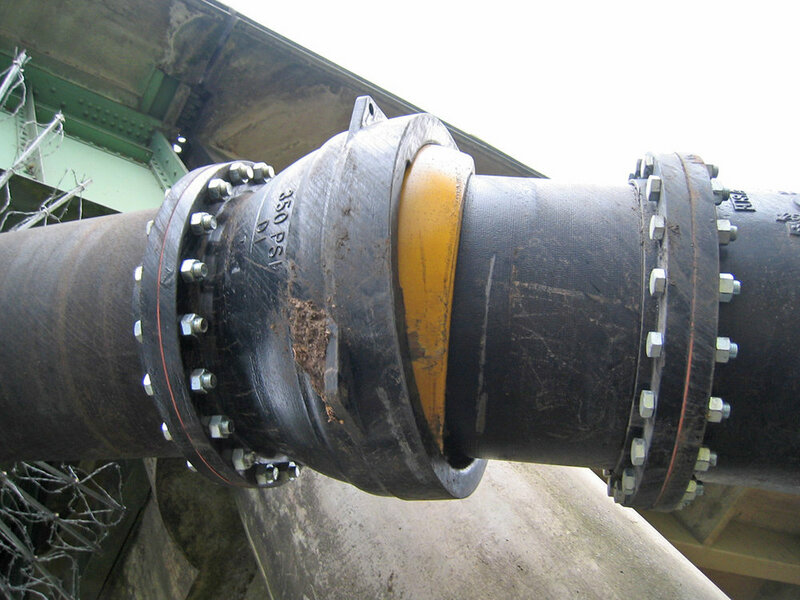 Provided with flexible rubber bands to secure to pipe ends and FJ-Restraint.